Welcome to North Charleston South Carolina. At the Candlewood Suites Hotel, we offer the ultimate suite for today's traveler. 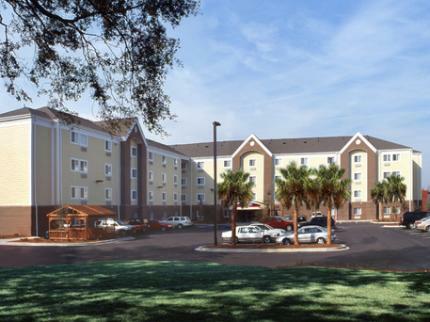 From the moment you enter the Candlewood Suites Hotel in North Charleston South Carolina you will feel right at home. Whether your visit brings you to us for business or pleasure, one night or an extended stay, the Candlewood Suites is ready to serve you. All of our suites are built for comfort and convenience with a fully equipped kitchen complete with refrigerator, stove top, microwave, and everything else you need to make that home cooked meal you've been craving. Work efficiently at your spacious desk with free high speed wireless Internet, two phone lines, and personalized voice-mail. Relax in your overstuffed recliner while watching a movie or listening to a CD from our free library available at the front desk. Work off stress in our fitness room. Use our free laundry facility and grab a snack or even a meal in the Candlewood Cupboard, our 24-hour convenience store with everything at value prices. From one night to many more, consider us home This hotel is committed to providing accessible facilities under the American Disabilities Act. If your accessibility needs are not met, please contact the Hotel Manager on Duty. Should you require additional information regarding accessible facilities for guests with disabilities, please call 1-800-Holiday (U.S. and Canada) or contact the hotel directly. For the hearing impaired, TDD service is available at 1-800-238-5544 within the U.S. and Canada.